The Burton AK Swash Jacket replaced the AK Stagger this year but if you aren’t blind you will notice that the big theme is the name change. There are some nice fabric and tech upgrades but it’s still very much the Stagger. I even thought it was the first time I looked at it here on video. 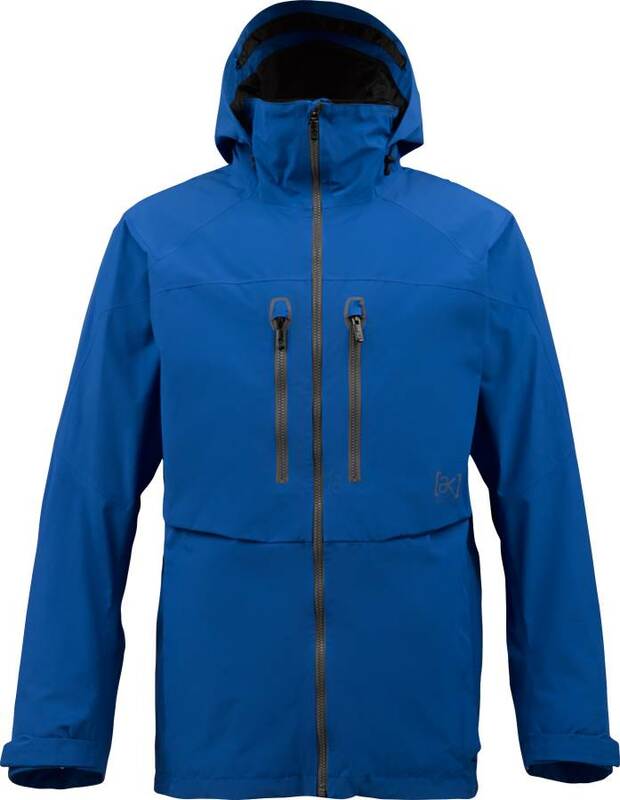 Last years stagger material went to some of the AK 2L Cyclic Jackets and the newer Burton does a great job with higher end technical outerwear and this is one of their best selling resort jackets. It’s just great for mountain riding because of the light insulation and borderline excellent waterproofing. Most people would prefer an ultralight shell for backcountry riding but this is more for keeping warmer than a shell on the mountain so you don’t have to layer up too much. Fit: Nice mid level fit that borders on being snug. Comfort: Burton makes very comfortable jackets and the liners in the Swash feel good even if you don’t have a first layer on and your buck naked underneath. Construction: The jacket is very well constructed but that’s to be expected with all Burton high end Jackets and I believe it has a lifetime warranty like other High end Ski Jacket companies which is re-assuring. It’s got a good amount of pockets and can hold most larger android phones in the communication pocket. Hood: For some the articulating hood is loved by those who don’t use their hood much and not liked by others who use their hood a lot. If you use the hood to shield your face it will get most of it but usually the corners of your cheeks are exposed no matter how you tighten the hood. The Stagger came with a built in balaclava that is stashed in the back of your collar and I believe the Swash does to so you can see Burton planned for that. It’s got a nice little fit over the nose/mouth kind of set up that allows your nose/mouth to vent without getting that area to wet. Waterproofing: The 2L Gore-Tex waterproofing is more than what the average rider needs but it’s so nice to have on a wet day. The only Jacket that will block more moisture is a 3L Gore-Tex Jacket but most don’t really need that unless they plan on being out in wet backcountry often. I ride close to 100 days every year and I’ve never needed more than 2L Gore-Tex but I mainly ride in the Sierras which is about middle ground. Breathability: It also can accommodate a slackcountry hike without overheating you if you don’t run too hot. Gore-Tex’s strength is it’s waterproofing but it’s breathability is still above average. For breathability its not rated but my guess is the extra insulation makes the jacket breath a little heavier around the body than your pure Gore-Tex shell that usually has around 20K or more breathability. Overall: So all in all this is a top notch resort to cold weather backcountry jacket that should accommodate the rider who wants a little more warmth than a shell and a lot more waterproofing than most jackets out there. We try to get as many images of the Burton AK 2L Swash, but forgive us if they're not all there. No matter how long you ride or how good you are: you probably know Burton and you definitely should know their famous AK line. Yes, the Swash Jacket and Pants are basically the new Stagger ones, but they did made some changes: The Swash has a thin Primaloft Insulation, the Interior looks way cleaner and the sound pocket has now a zipper. I used the Stagger Series for years and loved it! I know have the Swash Jkt & Pnt and i have to say Burton did some great improvements like they do every year. I had a hard time dealing with the zippers of the Staggers. Every March, after about 60-70 days on the mountain, the little flags where you pull the zipper (don´t know how to call them) brocke. The new Swash uses some rubber covered bands instead of metal. That should hold up much longer. James does a really good job with comparing but all in all i think sometimes he´s complaining on a really high level (which is good!). Ever AK Jacket and Pant has it´s own features. But all Jackets and Pants are guaranteed to keep you dry and warm for a longer period of time and are 100% functional. So which Jacket you should get, you´re asking? Well, if you have 600$ in your wallet to spend for a Jacket go for the 3l Freebird. If you have to look for every penny- save them and get the 2l Cyclic. I think the Swash Jacket gives you the best of both. But too Powder and Expedition driven and not too much of this park style. You think AK is expensive? Well they are but ever looked into Sweet Protektion or other high tech brands? AK Jackets are peanuts!